A Prophet has sat comfortably at the top of our Best of 2010 list since day one. But given that I hadn’t seen it, written about or even thought about it since October 09, I thought I’d better re-evaluate in time for it’s release on Blu-ray today. In short: it’s still amazing. Whenever Peter Bradshaw (The Guardian) and Wendy Ide (The Times) start trying to claim a film as their own (thereby certifying it as a go-to conversation topic at every middle-class dinner party in the UK) I tend to instinctively hate it. Unfortunately, A Prophet is too good to ignore. It’s epic in length and yet intimate in focus, Tahar Rahim’s performance is on another level and every frame looks total boss. It’s not quite perfect (the use of English-language music is particularly distracting) which in my book puts it just below The White Ribbon – to which it was endlessly compared earlier this year for the sole reason that DEY IS BOFE FORUN – but it’s still head and shoulders above most of this year’s releases. 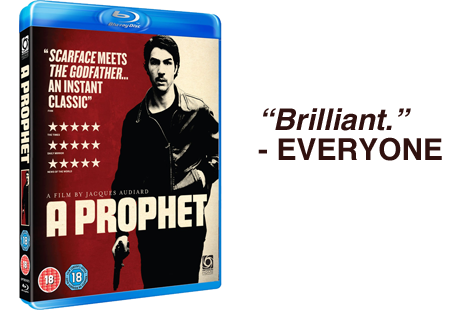 And as Blu-ray’s go, A Prophet is exemplary: beautiful colours, crisp detail and absolutely killer sound. In other words, its place on the list is safe. Need more proof? Tookey hated it.